The latest range of Otter switches and disconnectors is designed for high current DC applications including but not limited to; rail, trams, renewable energy, electric vehicle charging, DC distribution networks and industrial processes e.g. aluminium smelting, arc furnaces. The modular design adapts to various functions including isolation, fault making and load breaking. Designed and manufactured to high quality standards and comprehensively tested, ensuring high reliability and minimal maintenance. 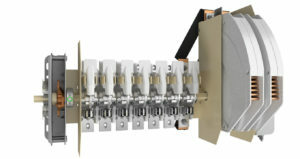 The switch can be offered as a standalone product, with or without a motor drive, or as part of a full switchgear assembly. Position indication by micro switch or auxiliary switch in addition to visual indication.